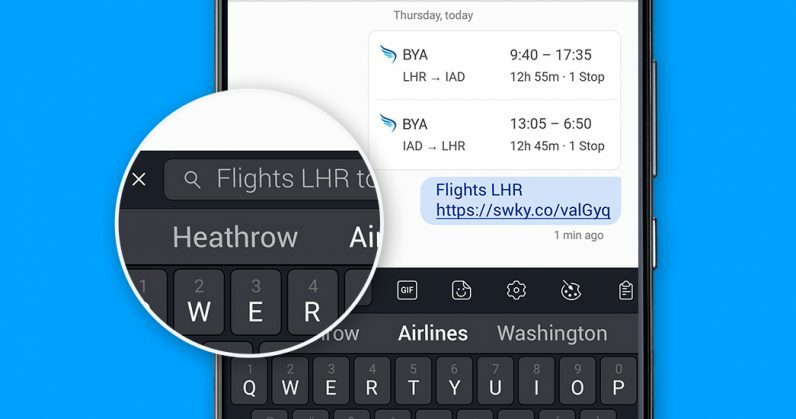 I’ve been switching between Google’s Gboard and SwiftKey for the past couple of years as my default Android software keyboard, because both of them offer compelling features. However, I’m partial to SwiftKey because of its arrow keys for moving around text – and I now have another reason to stick with it. The Microsoft-owned service now has a search bar built into the keyboard, so you can look up anything on the web, share the search results instantly, or even grab and send a screenshot on-the-fly – all without leaving the app you’re using right then. The only catch is that it uses Bing – but it’s really not all that bad. Google’s Gboard lets you search the web too, but I like that SwiftKey makes it easier to share the results with a link or a screenshot. This feature comes in handy for when you want to quickly add info from the web to your notes and to-do lists, or for when you want to convince your mate that you’re right about some inane trivia in your favorite messaging app. Just grab and crop a screenshot, and bam – point proven. The new feature is now rolling out to Android devices in 11 countries: the US, UK, Canada, France, Germany, Australia, Japan, Brazil, India, Italy and Spain. You can find it in the toolbar above the keyboard; if it doesn’t show up for you, update your app to the latest version and then tap the + button in the toolbar to bring it up. And if you haven’t tried SwiftKey yet, you can do so for free by grabbing the app from Google Play.